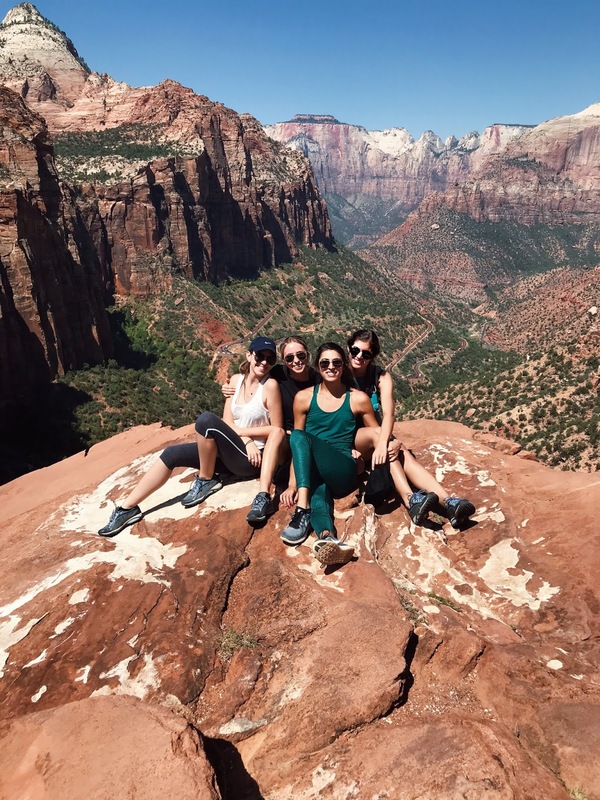 Last year (yes, I know I'm way late on this) my gals and I headed out west for a week-long hiking adventure. Hiking is one of my favorite things, and while we were there in the heat of the summer, it was incredible. The views alone were enough to make me want to do it all over again! My gal, Paige, and I flew out of Tampa to Vegas (Chelsea flew out of D.C and Anya flew out of Los Angeles). We landed in Vegas around 11am and killed a bit of time walking around some of the hotels. I have been to Vegas a few times with family, but it was a first time for my girls. We visited a few of my favorites including The Venetian and Caesar's Palace. After that we grabbed some groceries for the trip: protein bars, chips, trail mix, PB&J fixings and plastic bags for holding our electronics. Some of our hikes were around water, so we wanted to be sure they stayed dry. After that we head out for the 2.5 hour drive to Under Canvas at Zion National Park for our first stop. 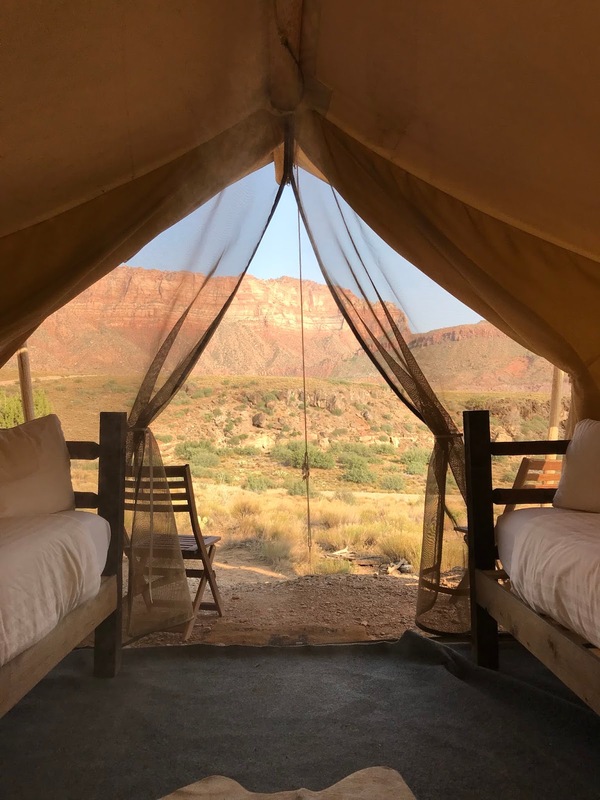 When we all saw the website for this "glamping" location, we were hooked. 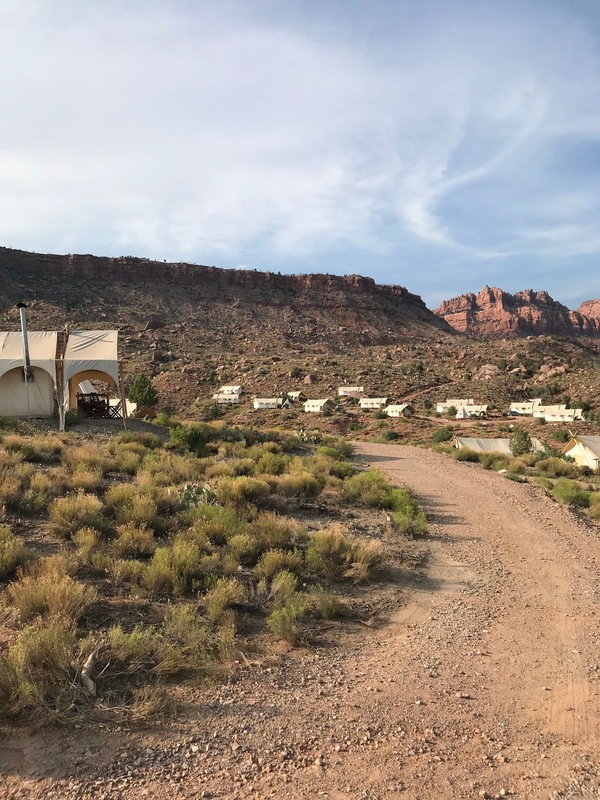 We booked a tent with four single beds and it had an awesome lookout to the canyons. Under Canvas was actually so much fun! They have a kitchen on site that we ate at for breakfast and dinner, plus tea, hot cocoa and s'mores each night. Each day they also offer complimentary yoga classes and a wine happy hour. 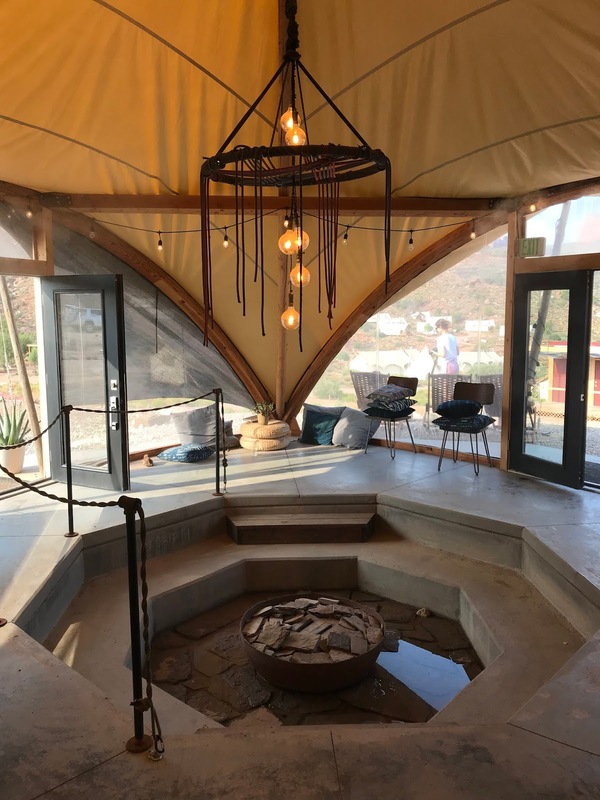 Keep in mind - there is no A/C and the bathrooms are separate outhouses that can get very hot during the summer months (we always showered at night after the sun was down). I have to admit, I had my doubts about this place. But, the location was great, staff was friendly and we were gone during the hottest points of the days hiking. We grabbed breakfast that morning and then head out to the park for a hike. There is an entry fee to enter the national park - standard fee per car and lasts for a few days. 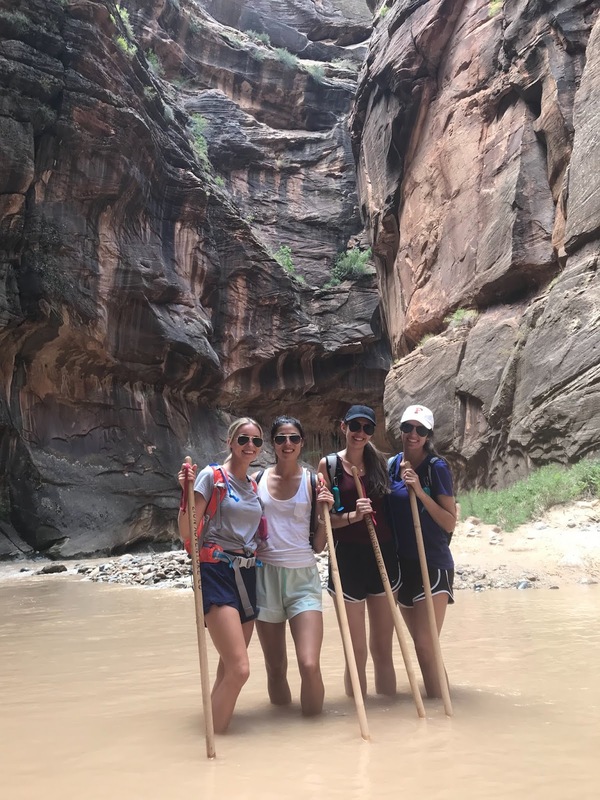 We chose to do The Narrows hike first - we were super excited for this one! 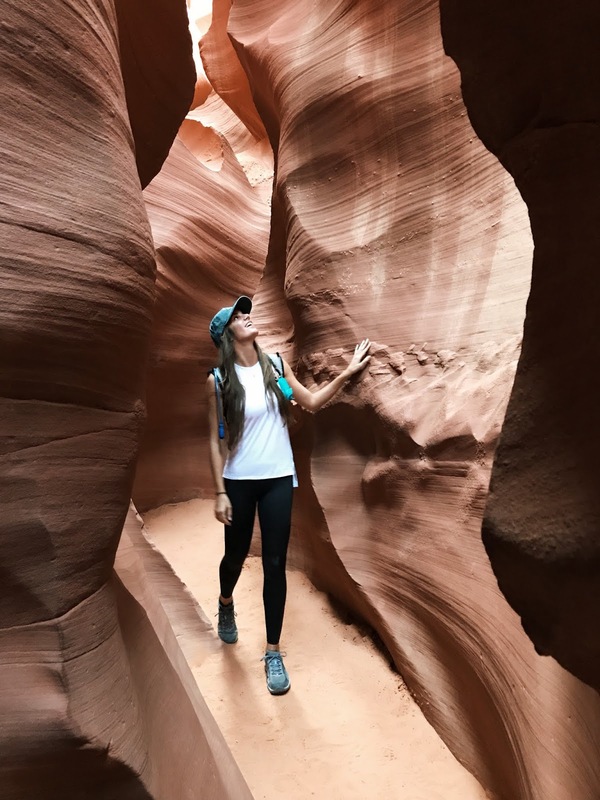 Most of the hike is done through water, so it's recommended to rent water shoes and a walking stick to keep your feet/ankles safe ($25 to rent). Beneath the water is nothing but rock and stones, so it's very easy to misstep. The water shoes are higher up on the ankles to help prevent injuries and come with neoprene socks to protect your feet. 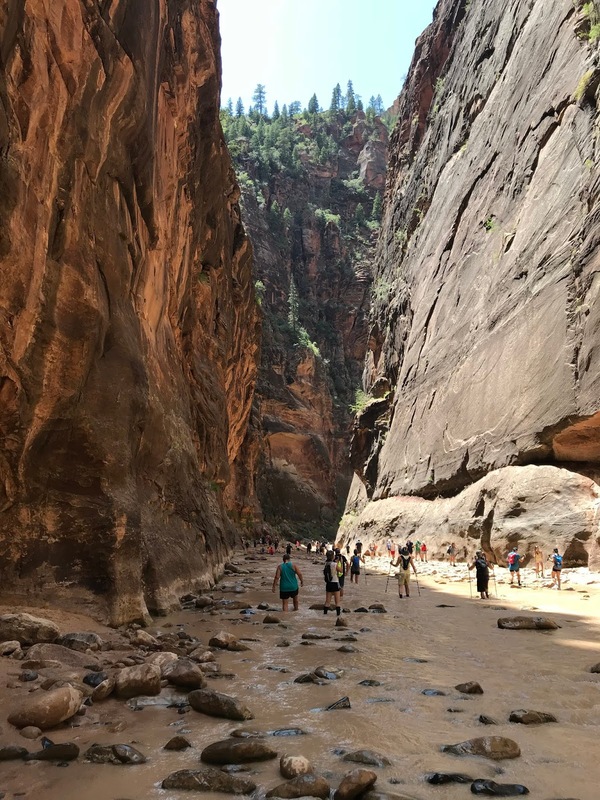 For The Narrows hike, you can expect to spend about 4 hours hiking depending on how far in you go. There is only one way in and out of the trail, but there are different splits along the way that offer different cliff formations for views. We packed small lunches to enjoy during the hike - we perched up onto a rocky part for a break and to eat. Our last morning in Zion we decided to do a short hike before heading to our next stop. 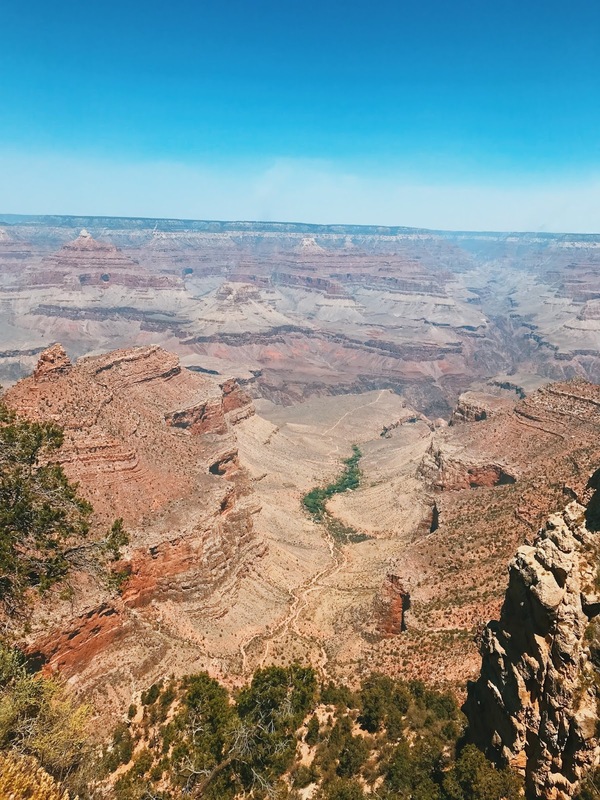 We opted for the Canyon Overlook trail - it's an easier one mile trail with a breathtaking view (see the first image in this post). 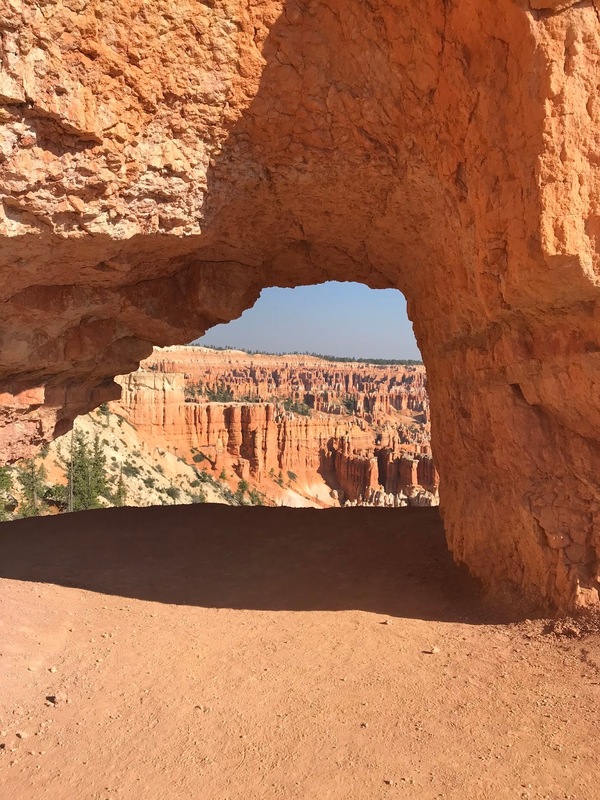 After that, we got on the road to Bryce Canyon National Park (about 1.5-hour drive). Given that we were driving on roads out in the middle of nowhere, we managed our schedule so that we were never driving after the sun set. In some areas there is limited or no phone service, and may be miles until a gas station or store appears. Just keep this in mind if you are unfamiliar with the surroundings! 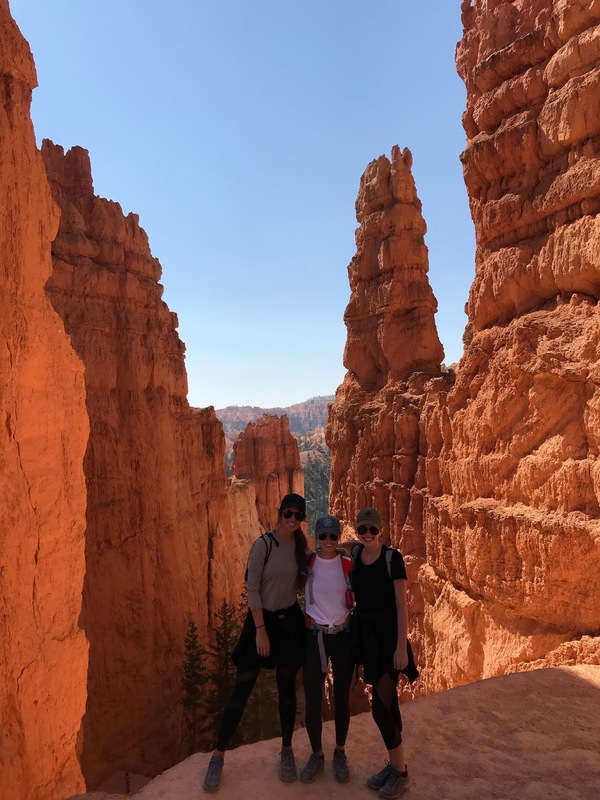 We chose to stay at the Bryce Canyon lodge for easy access (we were only here for one night) to hikes and the restaurant. Rather than leaving the park, we opted to eat dinner at their restaurant and the food was pretty good! 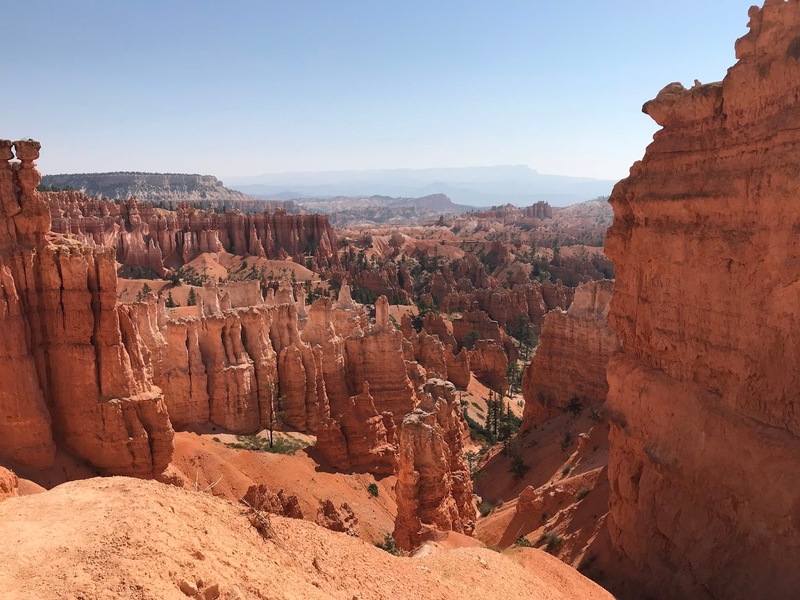 There is a park entrance fee at Bryce Canyon as well - you can expect that to be the case at any National Park you visit or drive through. The morning we woke up and watched the sunrise over Bryce Canyon - it was beautiful! After breakfast (there's a small coffee shop open on the park lodge grounds) we started on the Peekaboo Loop trail which takes you through the heart of the park. This trail is considered strenuous as there are some very steep parts throughout, but in reality it was a great workout! Haha we were definitely huffing and puffing at certain points. There are quite a few trails to choose from though that offer great views. After showering and packing our things, we hit the road to Page, Arizona (about 2.5-hour drive). 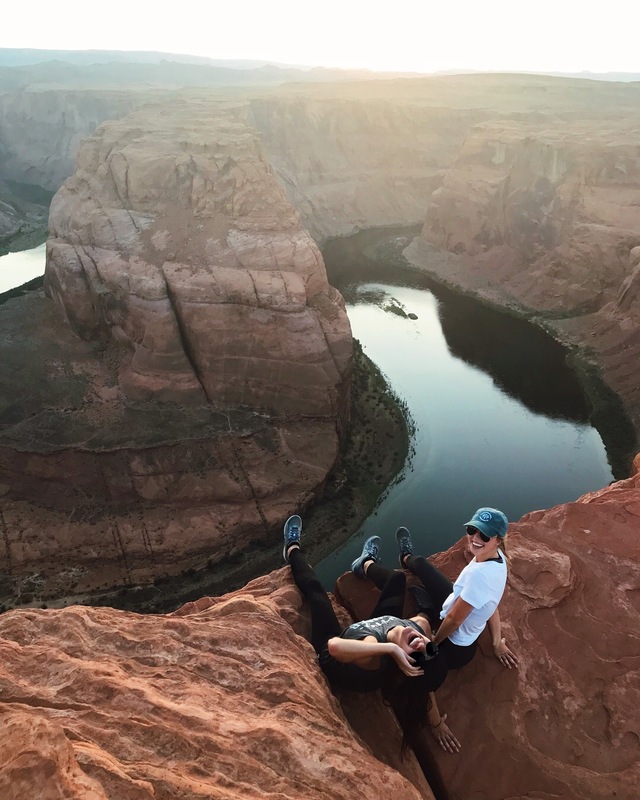 Page is home to both Horseshoe Bend and Antelope Canyon - each of those were top locations on our lists for this trip. We arrived in Page with some time to grab items from the grocery store for dinner at our AirBnB before heading to Horseshoe Bend for sunset. A few things to note about Horseshoe Bend - there is a decent walk to the lookout point from where you park, wear closed shoes as a lot of it is sandy, and bring a supply of water as there is none on site. Overall, watching the sunset here was magical before we turned in for a little girl's night. We whipped up some fresh salmon and sipped on wine before resting up for Antelope Canyon the next morning. 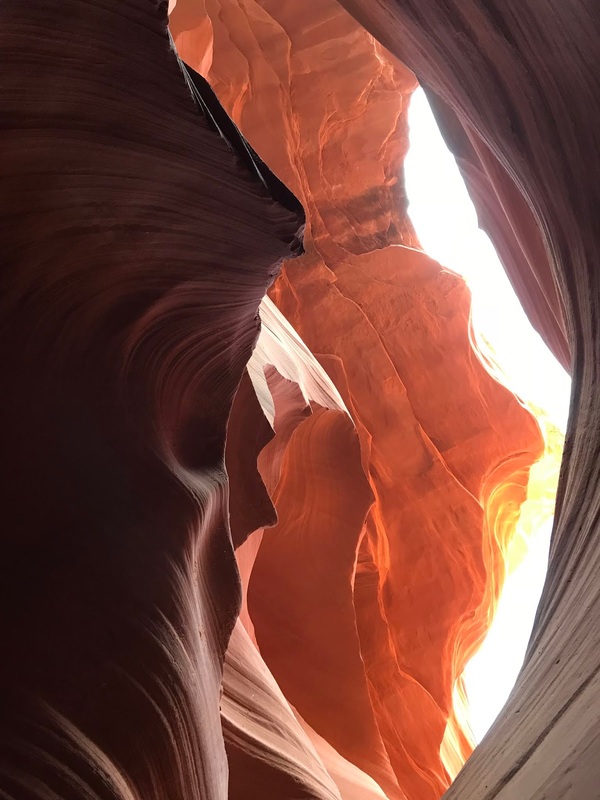 If you're planning to explore Antelope Canyon, you must buy tour tickets online in advance ($50/person). You are required to have a Navajo guide take you through the canyon at a designated time slot. We scheduled our tour for 6:30am and it was actually perfect! Visitors must arrive 30 minutes before their time slot to confirm payment, meet with the guide and hear the instructions. There are also rules for what you can and can't take into the canyon - be sure to read up on these in advance. *Most important to note: no bags, backpack or GoPros are allowed (Camelbaks are okay for water storage). 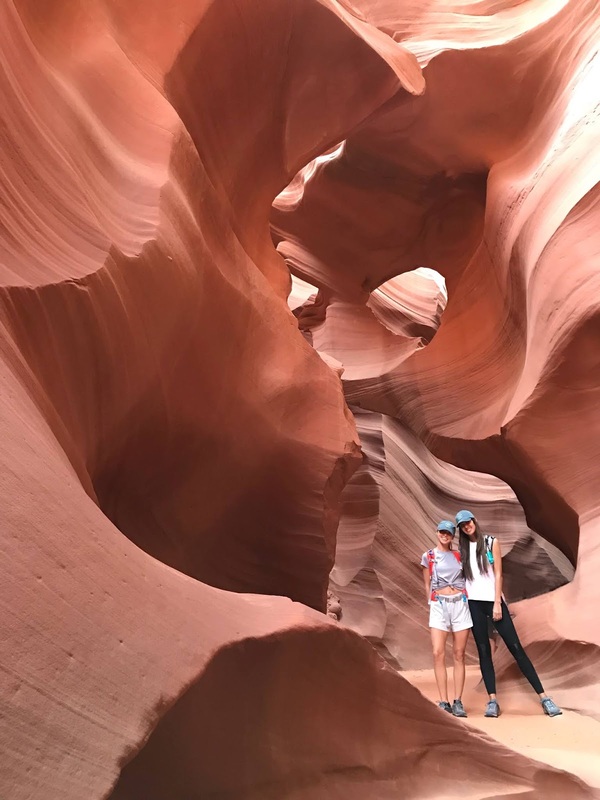 After our tour of Antelope Canyon we went home to pack our things and prepare for the next leg of our adventure to the Grand Canyon South Rim. Entrance to the Grand Canyon National Park is $35 per vehicle. 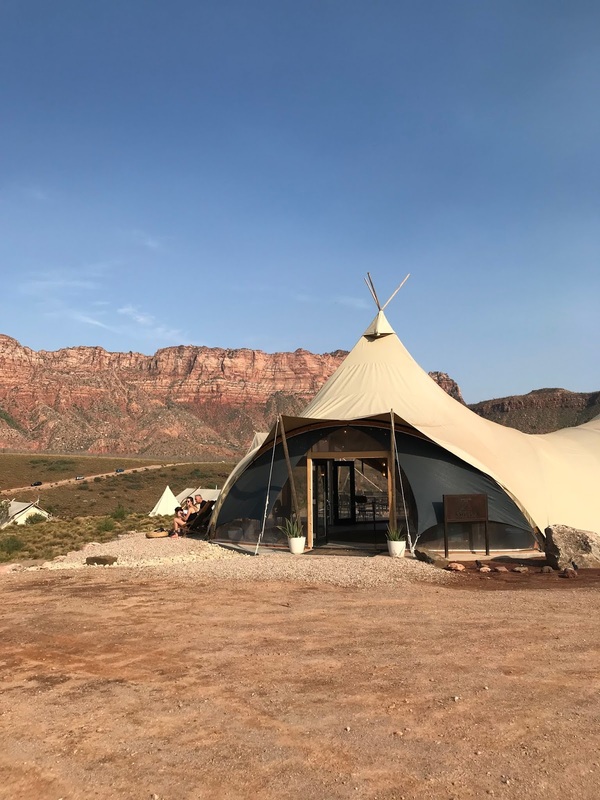 We booked a room at the Grand Canyon's Maswik Lodge. I will go ahead and tell you this now so you aren't shocked - cell service is SCARCE in this park. We actually lost phone service for most of the drive to the park as well, but thankfully our maps still seemed to work as we made our way. Some of the rooms have WiFi, but ours was very weak signal. We grabbed dinner at one of the park restaurants within walking distance - there are a few depending on where you're staying, and all have very versatile menus. P.S. there is an ice cream shop along the rim where the restaurants are that is so good!! You won't miss it, as the line was always out the door when we walked by. That morning we grabbed breakfast at the cafeteria at the lodge - super quick and reasonably priced! After that we head out on our hikes for the day. 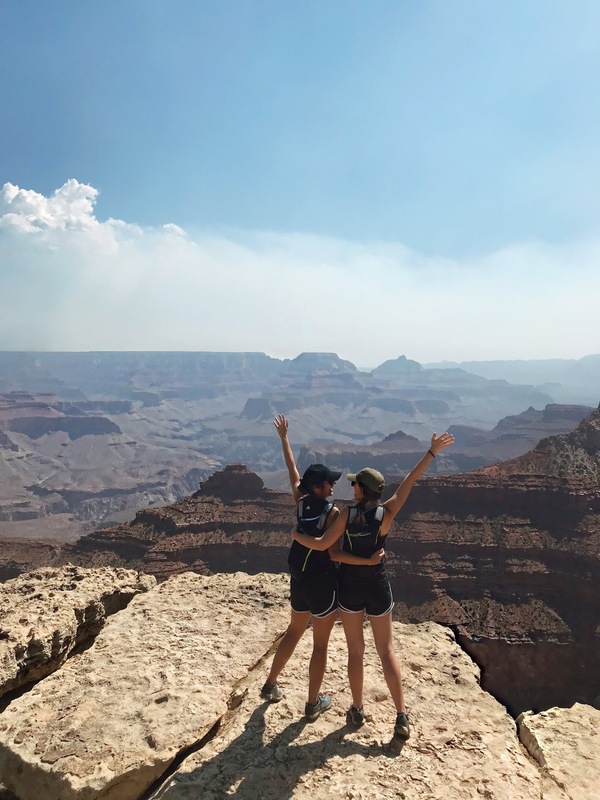 We ended up hiking part of the Rim Trail to get to the Bright Angel Trail. There are a bunch of buses that can take you all around the park and different stops. On the way there, we were wishing we hopped on a bus - it was very hot and longer than we judged it to be. But we made the most of it and got some extra steps in. The Bright Angel Trail goes pretty far into the Grand Canyon basin, but we decided to only go halfway given the time of day and heat. This trail had a lot of steps and at parts was very steep (be sure to bring water! ), but the lookout was gorgeous halfway down. On our way back to the lodge, we ventured out onto some cliff lookouts that were closer to the buses and snapped a few pictures. There were people all around at different times of the day and from all over the world - kinda like Disney. That morning we took our time to get breakfast, walk around the rim one more time and shower up before heading back to Vegas (about 4.5-hour drive). 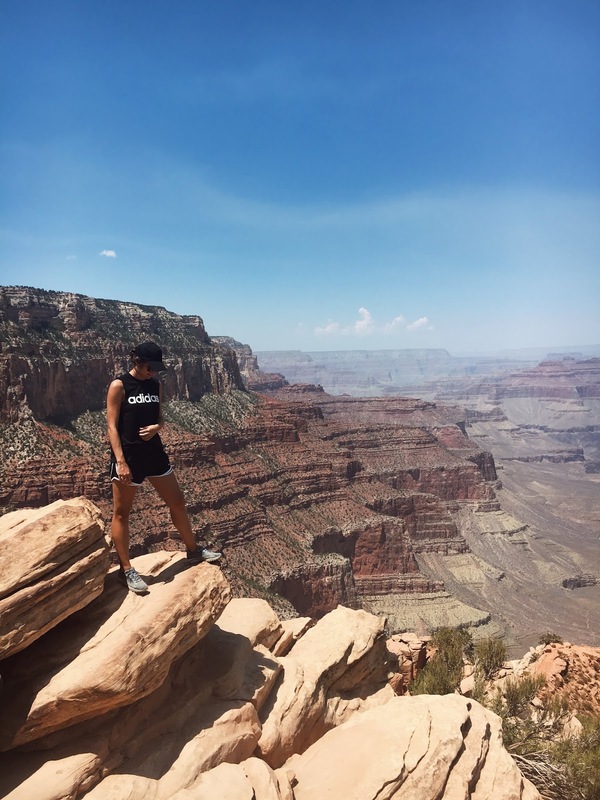 It was an on-the-go week, but it was full of amazing views, laughs and incredible memories. I can't wait for our next trip to a new location later this year for my bachelorette! If you're ever considering traveling out west to do a similar trip - don't think, book it! This seriously looks BEYOND amazing!